Yes, you did read the title of this article right. No, I’m not crazy. It seems like everyone wants to dump on linear periodization methods in recent years. It’s become trendy to claim that they don’t work, never did work and are generally going to cause your athletes to wither and fail. I contend, however, that linear periodization does work and is in fact still a very viable training methodology. In fact, I seriously feel that most people who demonize linear periodization never truly understood it in the first place. Yeah, that just happened. There are a lot of myths about linear periodization, one of the most popular being that gains made during one phase are lost during subsequent ones. E.g. Hypertrophy gains are lost by the end of the strength phase. But there are a couple of things wrong with this statement: first, hypertrophy phases aren’t always necessary or even beneficial (more on that in a moment). Second, if the athlete is training effectively, the loss of one phase should be minimal during the next. In fact, subsequent phases should build on previous gains. Third, even if one attribute is detrained it comes back better than ever the next time it is scheduled. If you’ve ever taken a month or so off from heavy lifting you know that when you come back you may be a little weaker at first, but that strength comes back fast and with a vengeance. Not picture: Speed squats & secret Russian methods. Another myth (though its more of a misconception) is that linear periodization is rigid and must include certain phases in a certain order: anatomical adaptation, hypertrophy, max strength and finally power. But what if an athlete doesn’t need a hypertrophy phase? Does that mean you should throw out linear models altogether? Or could you possibly do something crazy like NOT HAVE A HYPERTROPHY PHASE AT ALL. Insane I know. Take a second to let that sink in. 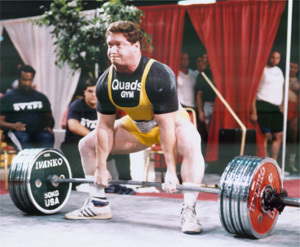 Here’s another thing commonly misunderstood: just because an athlete is in a certain phase, for example maximum strength, doesn’t mean that’s all they need to train. If you train 4 times a week, you don’t have to train heavy every day. There’s nothing wrong with having variety in a microcycle. In fact, that’s one of the best things you can do. This is a great way to maintain gains from a previous cycle. An athlete could use a 3:1 ratio of strength to hypertrophy for example. Or a light day could be scheduled to help facilitate recovery. Phase 1 – Adaptation & General Physical Preparedness. This is where you focus on your conditioning (cardio) more, possibly develop more unilateral strength and strengthen any nagging injuries. Phase 2 – Hypertrophy. Yeah, I did say that most athletes don’t necessarily need this phase, but for the average guy looking to build muscle it’s a good idea. Focus on building lots of functional muscle mass here. As always, the notion of getting stronger should always be hidden somewhere in there. Phase 3 – Max Strength. Here’s where you learn to recruit all that muscle you built. Train for performance and the physique will follow, but not the other way around. Phase 4 – Conversion & Power. This phase focuses more on explosiveness and athletics. By now you’re bigger and stronger. Now is the time to teach you body to use it. That’s just one example of how linear periodization can be used. In reality, there are lots of options based on what your goals are. Remember, no program is, or should be, set in stone. Just open your mind and learn the underlying concepts of the theory. If more trainers and coaches took the time to really understand these methods, rather than just dismiss them in favor of methods they prefer, the world would be a much better place.